The abortive French invasion of Ireland in 1796 bought about a scurry of tower buildings along the coasts, known as Martillo towers, so that signals could be passed from one to another in the event of another attack. 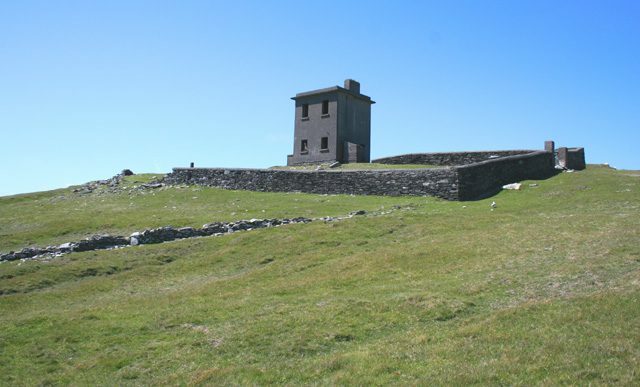 Valentia Island’s tower is said to have been constructed in 1815 for this purpose. It was used up until 1920’s by naval authorities as a signal station. The old Bray Head tower was briefly re-occupied by coast watchers during the ‘emergency’ (World War II); it was they who set stones in the turf below the tower to spell out EIRE to advise passing (or mislaid) aircraft where they were located.